Wyoming Producer-Consumer Alliance is a market place for Wyoming natural gas producers to provide natural gas service directly to Wyoming residents. A Wyoming resource for Wyoming residents that promotes jobs and economic growth in Wyoming. WPCA is one of the original participants of the Choice Gas Program. Our financial stability and long-term relationships with producers allow us to provide pricing options and flexible plans to meet the needs of Wyoming gas consumers. We understand that not every customer has the exact same needs. WPCA offers the flexibility of 3 pricing options for either 1 or 2 year terms. Whether you want to lock in your rate or allow for market fluctuations, we offer a solution to fit your budget and needs. Most often, you’ll see lower bills in the summer and higher bills in the winter, depending on the market price. The price per therm you pay is fixed or “locked in” for the contract term. Your bill changes solely based on volume of gas used. Your natural gas bill will increase or decrease each month depending on how much gas you use. A combination of monthly market index and/or fixed prices per therm. A portion of your gas usage is locked in at a fixed price. The remaining portion of your gas usage will follow market changes during the Choice Gas Program contract. 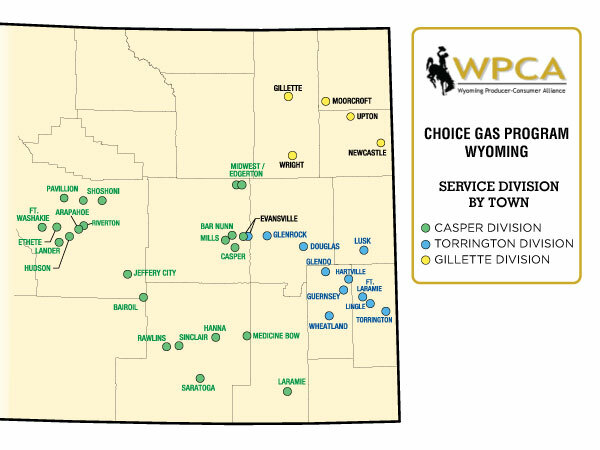 The towns participating in the Choice Gas Program in Wyoming are divided into three Rate Area Divisions: Casper, Gillette and Torrington. Natural gas rates and confirmation codes may be different for each division due to differences in distribution costs, infrastructure and other “upstream” costs. To see which Division your town falls into, see the map and towns listing below. You can select WPCA from this site or on the Black Hills web site. Check our Pricing Plans to find the Confirmation Code for your preferred pricing option. Once you have your Confirmation Code and your Control Number you can choose WPCA using our simple enrollment form. Sometimes it’s just easier to talk with a live person, we understand. We pride ourselves on our customer service and love to help. Call us at 1-877-GET-WPCA (1-877-438-9722) and we will be glad to help you make the selection that best meets your needs. Old School. We get it. And we can accommodate that. Simply complete the selection form (sent directly to you from the Choice Gas Program) and mail it back in the envelope supplied.